← The Promised Land- Will You Take it? Feel the peace and calmness roll over you. There’s a wonderful essential oil that people have used not only on themselves but on their children too. It’s called Peace & Calming Essential oil. It’s produced by Young Living Essential oils, the leader in the highest quality essential oils in the world. 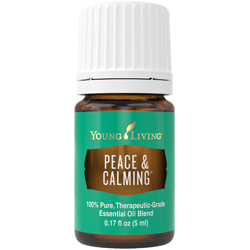 Peace & Calming is a gentle, sweet blend of Ylang Ylang, Orange, Tangerine, Patchouli, and Blue Tansy and is one of Young Living’s most popular essential oil blends. Put some on your hands and cup over your nose and mouth and inhale right before an important meeting. Helps freshen the air when diffused and improves the appearance of skin when applied topically. CAUTIONS: Keep out of reach of children. If you are pregnant, nursing, taking medication, or have a medical condition, consult a health professional prior to use. Avoid direct sunlight or UV rays for up to 12 hours after applying the product. Be sure to join our email list to get updates each time we blog an article. This entry was posted in Essential OIls, Oils for Emotions and tagged benefits of peace and calming eo, how to use peace and calming essential oil, peace and calming essential oil, Young Living. Bookmark the permalink.